Steven P. Jobs, Apple Inc. chairman and co-founder, died piecefully on Wednesday at the age of 56 surrounded by his family. No cause of death is issued, but it is believed to be health related matter. 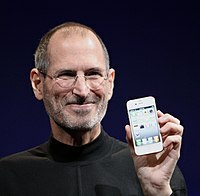 Starting out from his parents garage back at home, he and Steve Wozniak together build the legendary Apple Inc. at 70s. Their startup story is an extraordinary example of how two youngster tried to change the world with their ideas of computing. They have successfully built a cult: which had not died down even when Apple Inc gone through its dark ages in the beginning of 90s. The reason why Steve Jobs was GREAT is truly simple: he is able to be successful for at least twice during his entire lifetime. Not many people able to achieve that. Most of the great people manage to get successful and after being hit by failure, he/she couldn't get up and be successful again. Not only Steve Jobs is able to do so, he managed to scale new heights with his second success. How? Steve Jobs, together with Steve Wozniak, stormed into the computer scene by designed, developed, and marketed one of the first commercially successsful lines of personal computers, the Apple II series. Then, he got kicked out from Apple Inc. by the very man he bring into Apple, John Sculley (from PepsiCo Inc.). After ding dong ding dong outside of Apple Inc. for around 10 years creating NeXT Inc. and bought over Lucasfilm Ltd (later renamed Pixar Animation Studios), Mr Jobs came back to rescue the foundering Apple Inc (loses nearly $2 billion in 2 years) in 1997. And after that, his introduction of iMac, iPod, iTunes, iPhone, iPad etc changed the world.